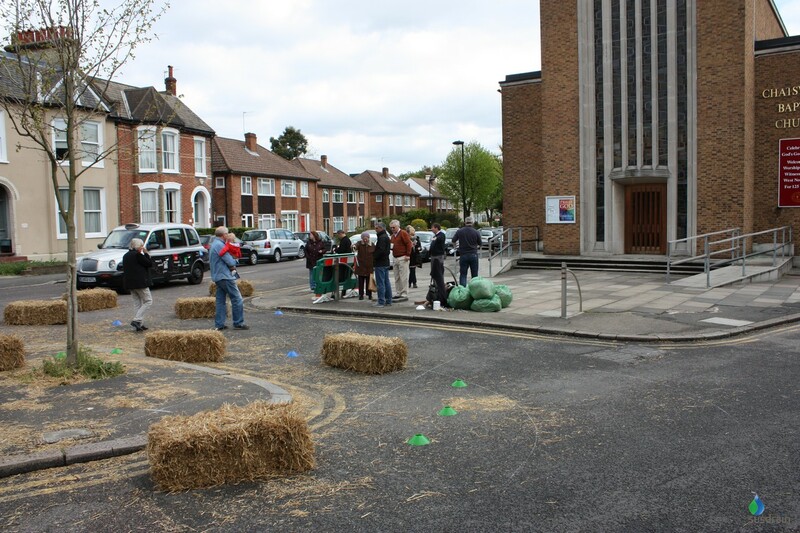 On May 11 a bright but damp Saturday morning (with the ever present threat of more potential rain) Sustrans and Lambeth Council Green Streets project delivered another community engagement event, this time with a difference. It is at this stage of the engagement activities that the community informed designs for the Green Streets start to come to life for those living in the area. 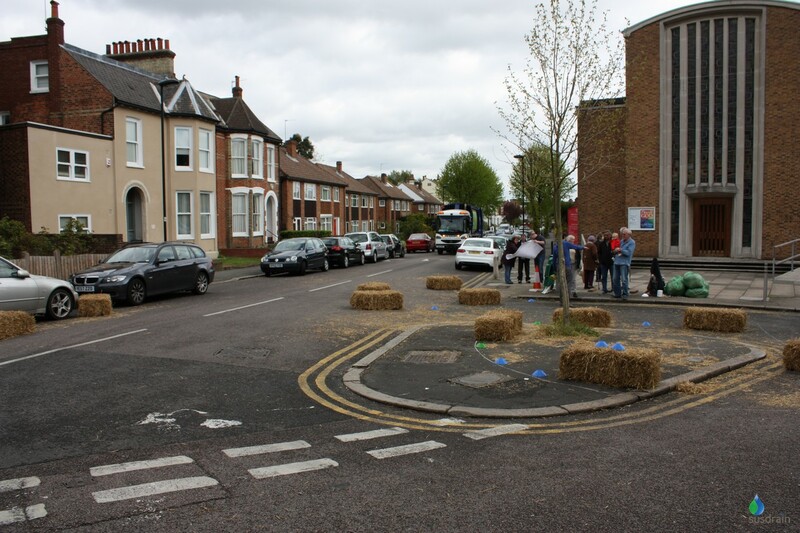 Straw bales, cones and chalk were used to present the life-size designs on the streets illustrating changes in road layout and potential rain gardens which were being altered to improve surface water management, road safety and deliver green infrastructure. 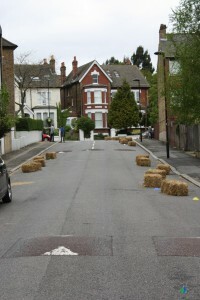 The team started at Chatsworth Way (Norwood, South London), using straw bales to mark the changes and build-outs at the junction with Idmiston Road. Here, outside the Church was to be the base for discussion and engagement with residents for most of the morning, with samples of the permeable paving blocks to hand and the straw bales and cones demarking changes. 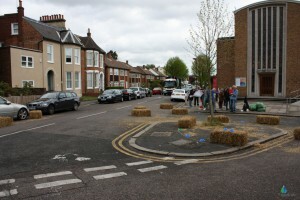 Comments about turning the area into a community farm (with the straw bales) were soon displaced by residents concern about loss of parking once they realised that the straw bales, cones and annotated build-outs would mean not being able to park their cars in front of their houses (for about four or five houses). Within in ten minutes of arriving Owen Davies, Lambeth’s Sustainability Engineer was holding a map and discussing in detail the options with a number of residents, both interested and anxious about the planned changes. 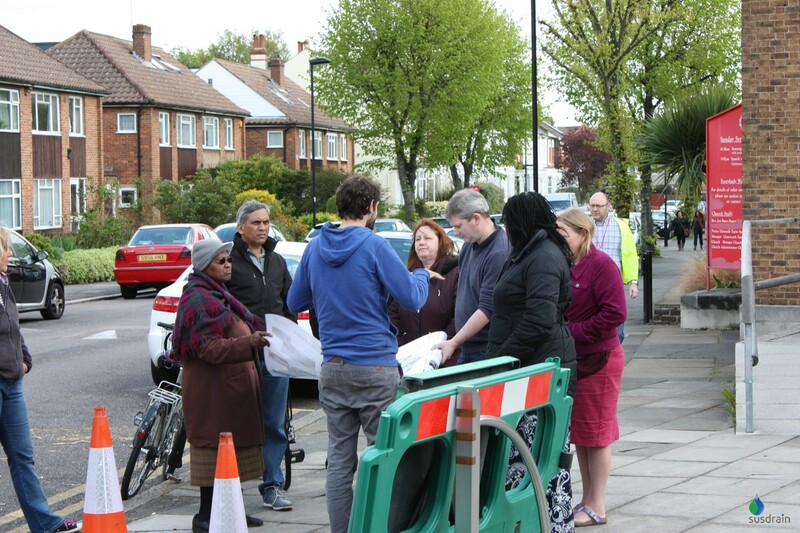 The community event was a fantastic way to engage with those residents that for whatever reason hadn’t previously heard about the Green Streets project, nor attended the (well publicised) four community drop-in-sessions that had occurred since October 2012. Despite having undertaken surveys that suggested there was some spare car packing capacity emotions ran high about the potential loss of parking spaces and some of the changes, with residents wondering about what it would mean for the operation of key local facilities like the church and nursery. That said, there was gratitude for some of the other design changes previously introduced to reduce the loss of spaces (based on resident engagement), particularly as this would demarcate driveways and associated drop kerbs with the added intention of creating a visual deflection to drivers. During the morning it had also been arranged for a number of large vehicles to drive around the area including a dustcart and an eight wheeled articulated mechanical ‘grab’. This provided valuable feedback to the urban designer, from Sustrans about practicalities, road width, clearances etc (she also seemed to enjoy the drive around the area in the cab with the driver, and the opportunity to observe what road changes worked and what didn’t). After a couple of hours and with some clear take-away messages we moved to Ardlui Road and with cones and straw-bales again demarking changes to the road with more free-flowing buildouts and rain gardens. This sparked some interest, however there was more interest about buildouts at the proposed raised junctions, particularly the junction with Lancaster Avenue (one of the main thoroughfares to the south circular). It was thought that there might not be that many considerate drivers on the school run, and the restricted junctions would cause significant tailbacks at school opening and closing times. Sustrans promised to visit the area again during the school runs and assess what impacts some of the final designs could have. While probably a little more stressful than some of the previous drop-in sessions, this provided valuable feedback on residents concerns and the practicalities of the design. It’s better that this engagement with residents happens now, rather than during construction. There will be some more consultation highlighting the tweaks responding to the comments made on the day, before construction begins in September.